KATHMANDU, Oct 8: As many as 18 companies are awaiting the nod of the Securities Board of Nepal (Sebon) to launch rights issue worth Rs 12.94 billion. They are floating 129.43 million units of shares to their shareholders. Most of these companies are bank and financial institutions (BFIs) that are under the regulatory pressure to raise their paid-up capital. Prabhu Bank Ltd and Civil Bank Ltd plan to raise the highest amount of capital among 18 companies whose rights issue is in the pipeline. By offering 10:4 (23.53 million units) rights issue, Prabhu Bank Ltd plans to collect Rs 2.35 billion in capital from existing shareholders. Similarly, Civil Bank Ltd is also floating 20.74 million units of shares on right issue to collect Rs 2.07 billion. Api Power Company Ltd also has a mega rights issue on the cards. It is seeking the Sebon's approval to float 21 million units of rights issue worth Rs 2.1 billion. Shangrila Development Bank Ltd is another financial institution that is applying for rights issue worth above Rs 1 billion. 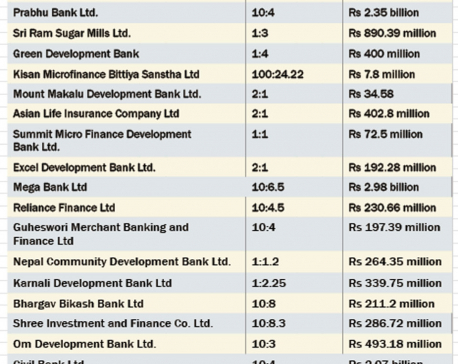 According to the Sebon's figure, the development bank aims to draw Rs 1.09 billion in capital from its shareholders by offering them 10.87 million unit rights shares in the ration of 10:8. Similarly, insurance companies also seemed to have felt the rush to meet new minimum paid-up capital requirement as set by their regulator recently. Four insurance companies have already applied at the Sebon, seeking approval to float their rights issue. Prudential Insurance Company Ltd, Gurans Life Insurance Company Ltd, Asian Life Insurance Company Ltd and Everest Insurance Company Ltd are seeking the Sebon's approval for the rights issue. According to the Sebon's data, Gurans Life is planning to float 2.97 million units of shares on the rights issue. The insurance company aims to collect Rs 297 million from the investors. Similarly, Prudential Insurance Company Ltd and Asian Life Insurance Company Ltd have also sought the Sebon's go-ahead to float 1.28 million and 4.3 million units of shares to the existing shareholders, respectively, to collect Rs 128.3 million and Rs 402.8 million. Everest Insurance Company Ltd also has plans to offer 1:6 rights issue to shareholders, or float 7.29 million units of shares, to collect Rs 759 million from investors. 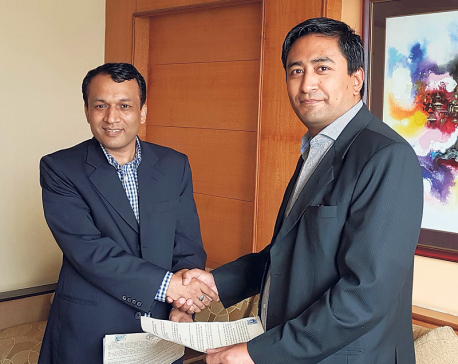 Central Finance Ltd, Shree Investment and Finance Company Ltd, Karnali Development Bank Ltd, Gandaki Bikas Bank Ltd, Siddhartha Bank Ltd and Sahara Bikash Bank Ltd are also in the process to float their rights issue. Likewise, Mount Makalu Development Bank Ltd, Green Development Bank Ltd and Reliance Finance Ltd are the other public companies that are seeking Sebon's approval to raise their capital through rights issue.